Last week NADCA held it’s 2014 Tabletop Show in Milwaukee, Wisconsin which was a resounding success with over 1,000 attendees. One of the highlights of the Show was the Awards Luncheon held on Tuesday September 23rd, 2014. During the Luncheon NADCA presents Safety Awards, Design Awards, Education Awards, Instructor of the Year Award, Best Congress Paper Award, and the highly coveted Herman H. Doehler Award. The Doehler Award is given out in recognition of outstanding contributions to the advancement of the die casting industry or to the art of die casting.Worldwide. Technical Achievement – as measured by significant scientific contributions of a metallurgical or engineering nature relating to the die casting process. Advancement in Plant Operations – of a management or administrative nature and related to the operational phases of the industry safety procedures, devices and techniques, practical mechanical advances related to efficiency, economy and safety of plant operations. Other Activities – that result in the enhancement of the reputation and acceptability of die castings. All contributions to the progress of the art of die casting and advancement of the industry are to be evaluated on the applicability of the contribution to the die casting industry as a whole. Jack is a long time member of NADCA and has been involved in die casting technology for 44 years. In 1981 Jack founded Visi-Trak to sell monitor and control systems specifically for the die casting application. Visi-Trak has been a corporate member of NADCA since it was founded and prior to that Visi-Trak was a Charter Member of ADCI which was the corporate die casting association before NADCA was formed. Jack and Visi-Trak remain committed to advancing the die casting process and helping customers increase profitability. The strong association with NADCA and support of other industry research efforts at several colleges and universities has helped support that goal. 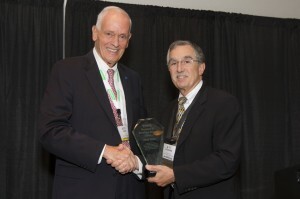 In 2012, Jack also received the Nysellius Award at the NADCA Awards Dinner in recognition of his exceptional technical contributions to the industry. I have known Jack Vann for nearly 40 years and have been doing business with him at Visi-Trak for almost that amount of time. Premier currently uses Visi-Trak monitoring systems on most of the die casting cells and we have some servo valve technology employed on a few of the die cast machines also.